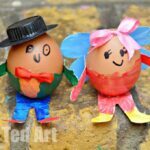 Soooo… it is THAT time of year again.. the time of year, when schools around the country (here in the UK ) are hosting either their Easter Bonnet Decorating competitions or their School Egg Decorating competitions (or both!). 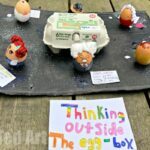 My kids’ school hosts an Egg Decorating competition and we have been entering it now for a number of years. 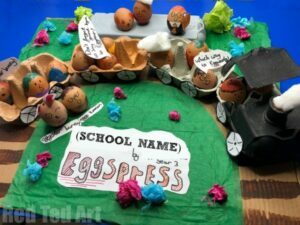 It has taken us this long, to realise that the egg decorations that include “mini scences” and/ or humour tend to do well – below we outline our best tips and tricks for how to win a school Egg Decorating competition!! 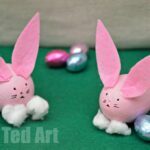 So Red Ted and Pip Squeak now spend all year hatching plans (pun intended) the following School Egg decorating Competitions! Over the years, we have had a number of wins now.. from our first win with our Mr Men Decorations here and Pip Squeak her debut entry of her Eggcellent Hairdresser (see below). 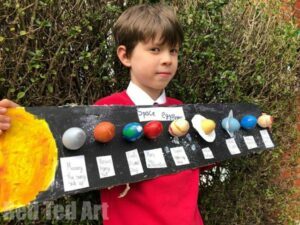 We also won with Eggsplorer Solar System Eggs and the Eggcellent EggSpress. As well as our “Too Tall for School” entry (see below). Anyway.. our top tips for how to win the School Egg Decorating competition. These competition entry ideas where first shared in March 2015 and have been republished for your conveniences! Make it funny! Yes, you **NEED PUNS** and you will simply have to make it up. Teachers have a busy day and though they may be impressed with your art work, they also like to smile. Make them smile… even better make them laugh! So lots of EGG related puns. Thing EGGcellent, EGGstatic, EGGxplorer, EGGcited, EGG-head, cracked Eggs, Scrambled Eggs, fried eggs.. add other languages like “Oeuf” and see what you can come up with! Good quality paints can make all the difference to that finished look – have a set of these Gloss Enamels Paints (UK affiliate links), they are not super cheap, but they have lasted me aaaaages. Here is a great set for US readers. Finally – if you can – plan ahead and take your time. Then you can have more fun with your creation.. and you will have more time to think of funny details to add! Remember.. they don’t have to be super complicated to win.. surprise your teachers! Pip Squeak one year, made a VERY quick and easy Cress Head Hair Dresser Salon and it surprised the teachers so much, she won! 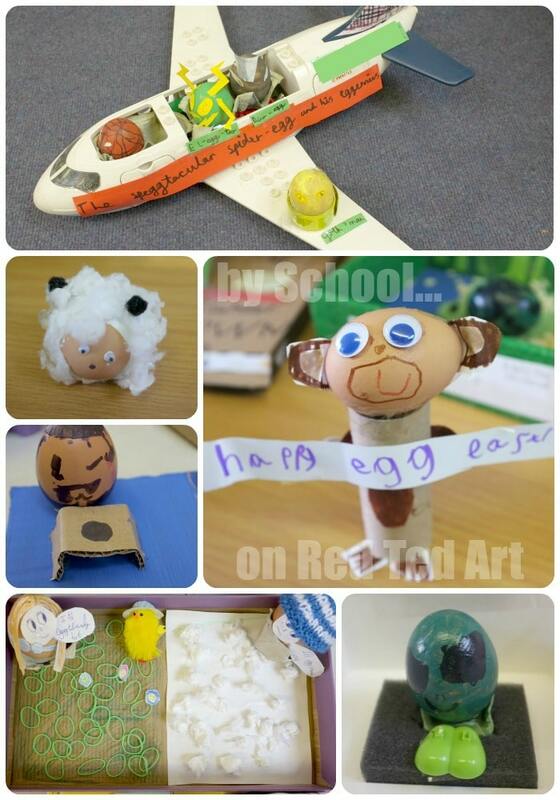 I have to say all the School Egg Decoration Competition entries were simply Eggcellent. 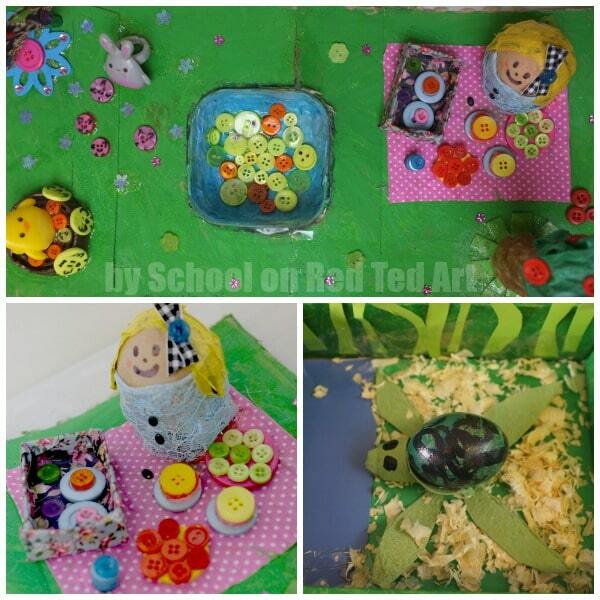 So many fun, clever, quirky and creative ideas, that I asked to photograph them all and show you. 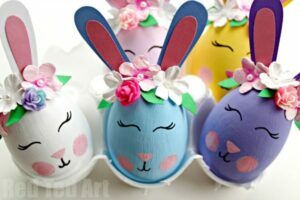 There were SOOOOO many, I couldn’t photograph them all, but I tried to pick as many as possible.. so here is some eggcellent Egg Decorating inspiration, if you are planning yours for next year. 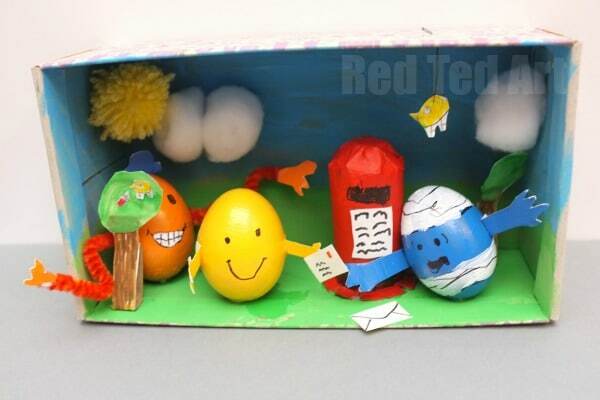 Here is Red Ted’s Mr Men Eggs. Yay for winning, well done son! 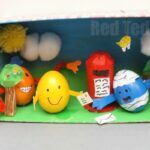 Another winning entry (2018) was Red Ted’s Space Eggsplorer Solar System Eggs! 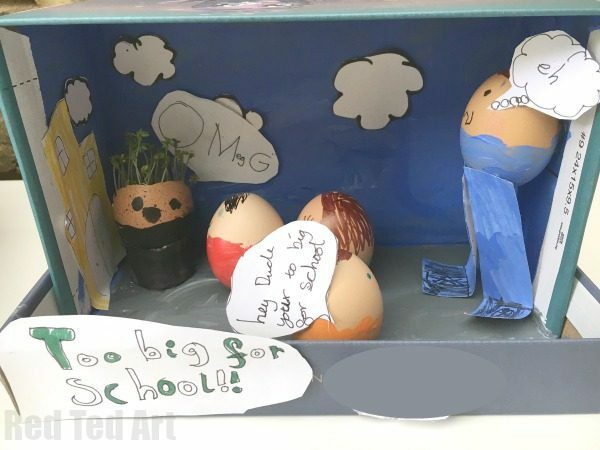 Tying in with the curriculum and with some great puns, this was an eggcellent entry sure to tickle the teachers.. and it did. He won! Whoop. 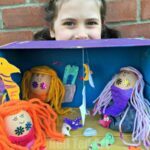 Another School Egg Decorating Competition WINNER is this Eggcellent EggSpress. 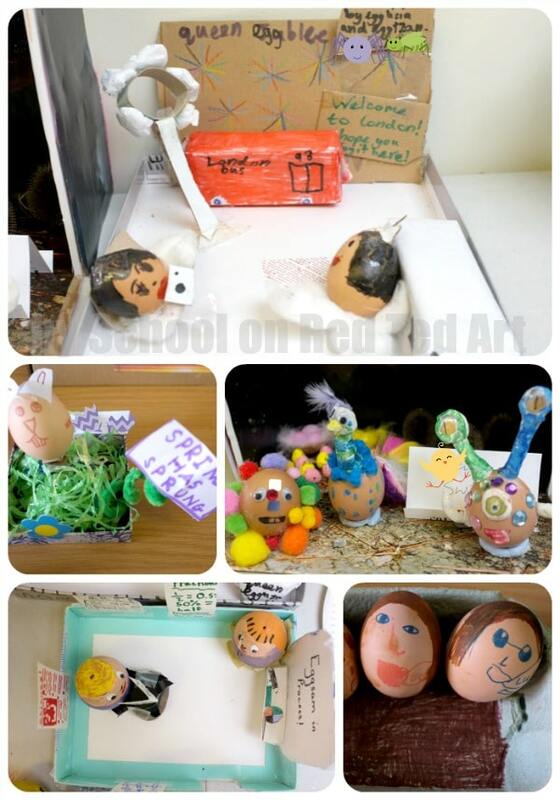 We had great fun making an Egg Carton Train filled with Egg People (16 no less!). 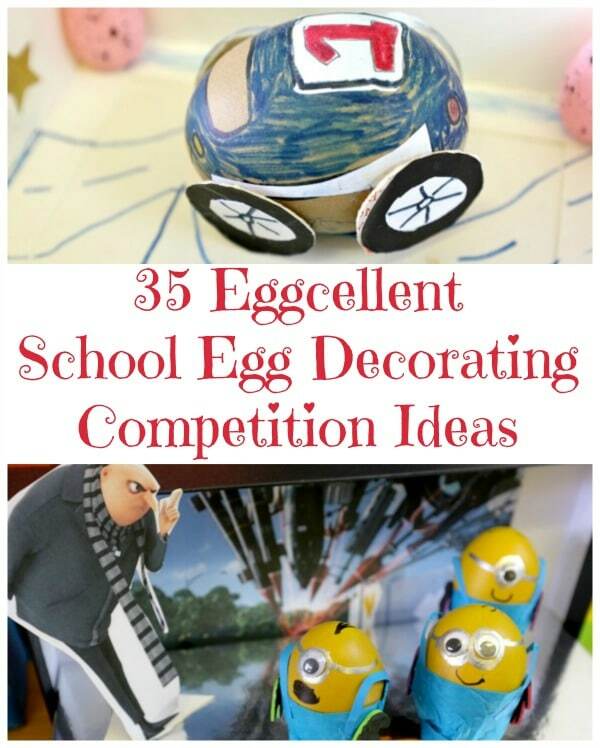 Now on to some more School Egg Decorating Competition Ideas!! 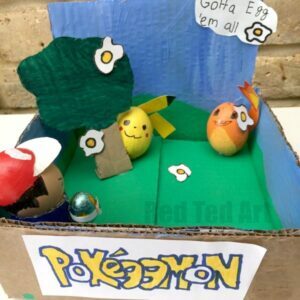 Pok-Egg-Mon – another entry from “us” (added to this round up) – read all about our DIY Pokemon Egg Diorama (did it win??). 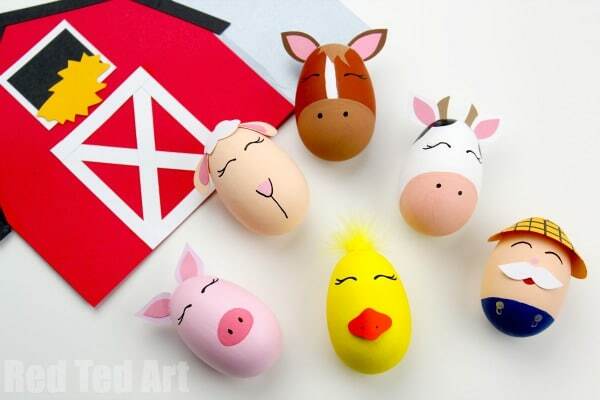 Bring this classic Nursery Song to life with a fabulous Old MacDonald Egg Decorating diorama – complete with template for all the animals and the Farm Barn!!! Cutest little Flower Bunny Eggs! How fun are these?! Love! 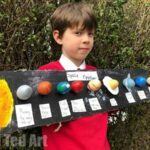 Updated: Pip Squeak’s (then 7yrs) School Egg Decorating Competition entry 2017: Too Big for School and a **competition winner**. The teacher’s loved the school references.. and I think are always tickled by the cress hair.. remember you need to TIME the growing of cress hair just right!! Read about Cress Heads here. 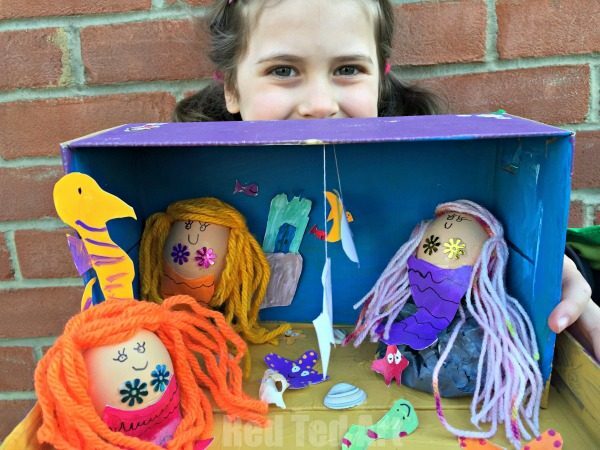 We had LOTS of fun with this cute Mermaid Egg Diorama! This one has a full set of instructions here! Enjoy! 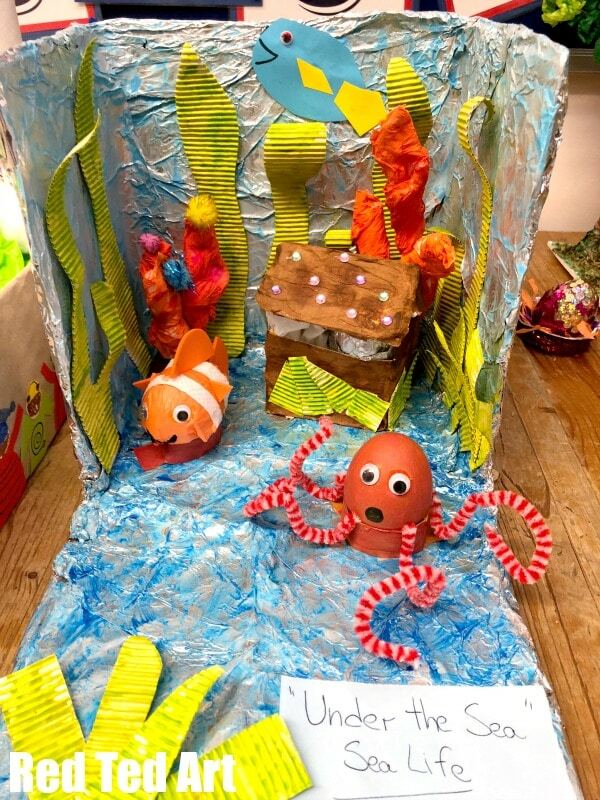 Another cute under the sea theme by a fellow pupil is this Under The Sea sea life diorama. Love the little octopus and clown fish. So cute! 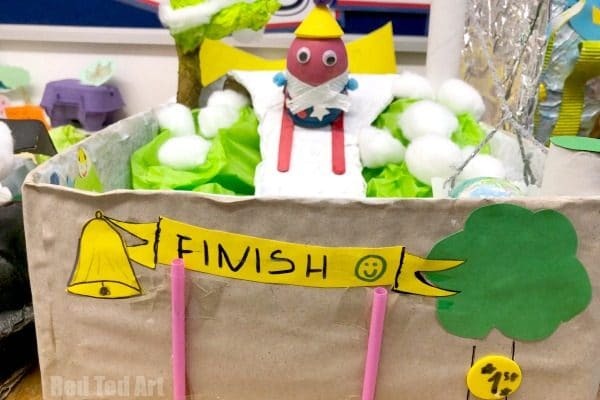 Incorporating last year’s Winter Olympics, this is a great topical Skiing Egg Theme (also love that bit of BrEGGsit in the background.. very on topic!). 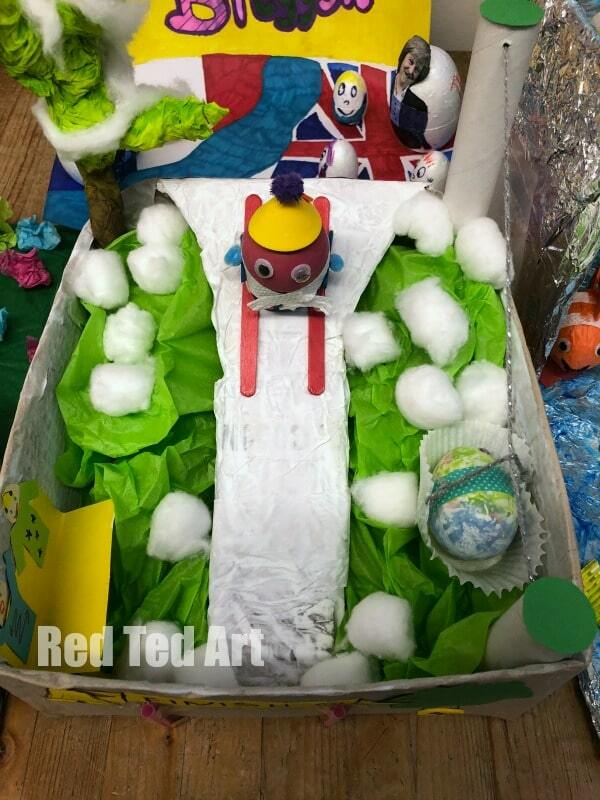 Another view of the skiing egg! 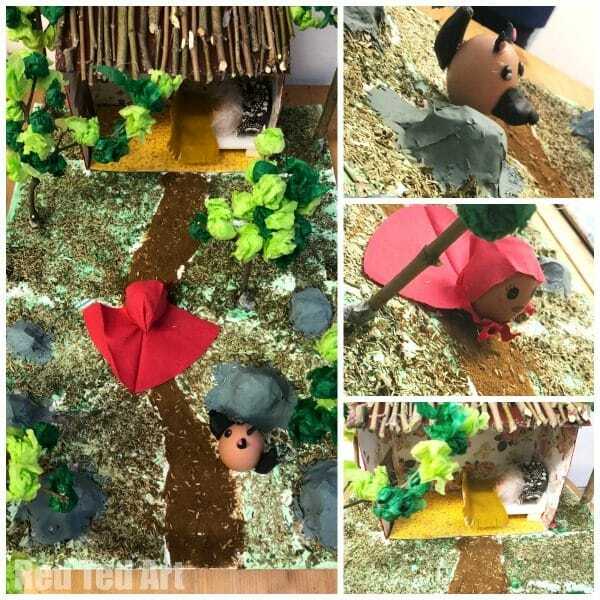 Rather a lot of AMAZING detail went into this little Red Riding Hood Egg diorama! What a clever use of plasticine to make the wolf.. and love the use of twigs and trees for the scenary and grandma’s hows. Just Eggcellent! One of my PERSONAL FAVOURITES (I am allowed to have favourites, as I wasn’t judging! ha), are these seriously cute Egg Hedgehogs. Big points of originality from me! A picnic and pond scene – personally, I LOVED this one – so much detail went into it and I think the picnic idea is just too cute. Sadly NOT one of the winning entries, yet, I would have picked it for sure. 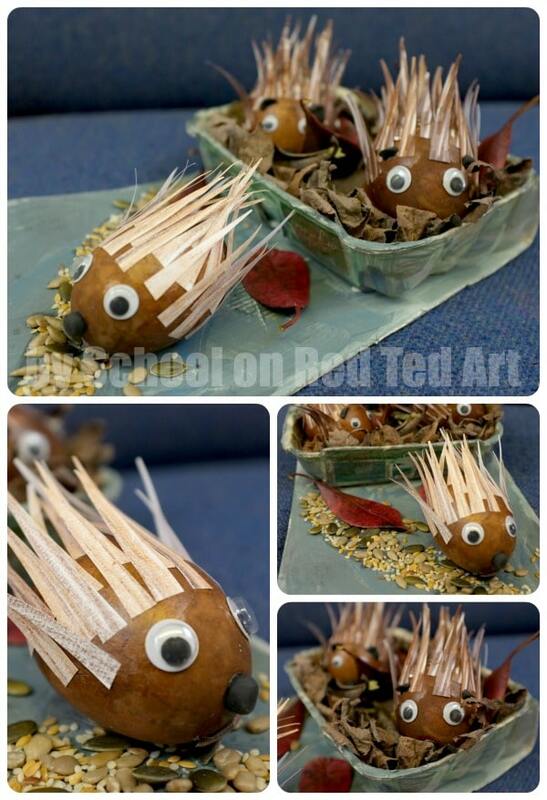 Also above, is an adorable “Turtle” egg by Reception (4-5yrs olds), which was one the 8 winners. Hooray. 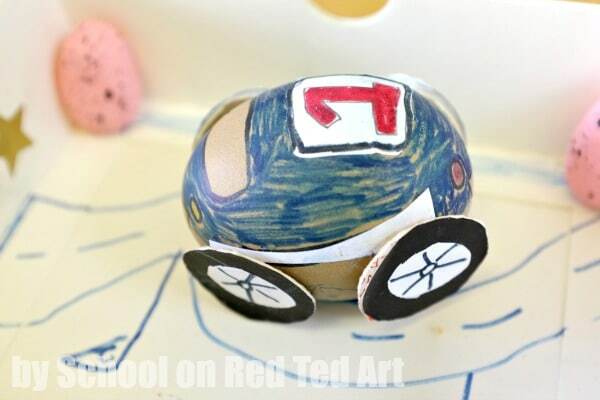 Egg Racing Car – one of MY personal favourites. Simple, but just adorable. And so, on to the pun on words. 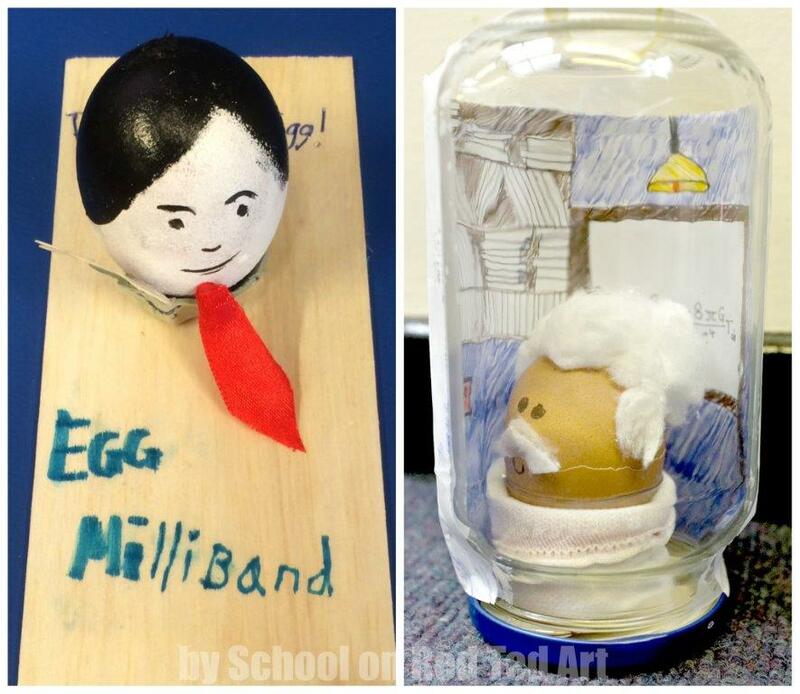 This begins with winning Egg Milliband – brilliant – and I also adored this Eggbert Eistein idea. Next we have a triple set of photos (sorry, this was the quicker way to edit these). 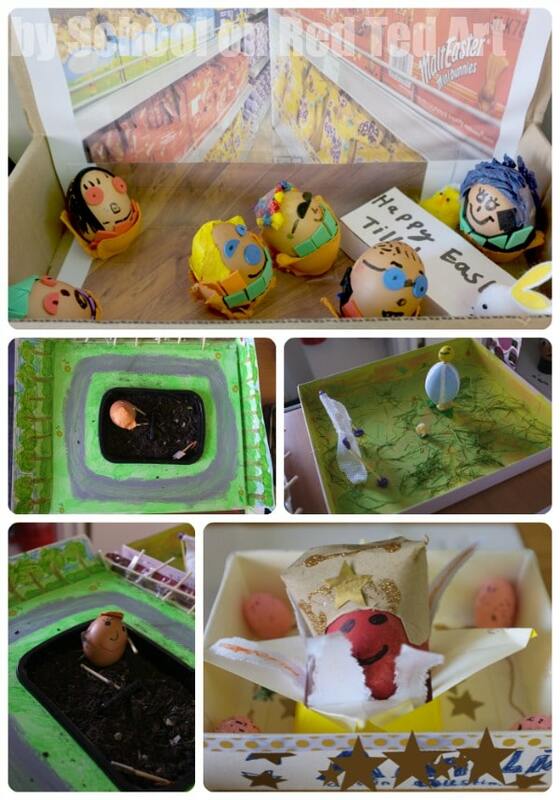 At the top we have a winning entry with the “Good Egg/ Bad Egg”. This was a sibling team effort, with the younger brother creating the Super Egg and the older brother creating the bad egg. I love the mustache and London scenery in the back. Next we have an Egg-tastic Fashion Show – I confess, the photo does not do it just – it came in a huge box – well decorated.. and I only managed to capture the models. 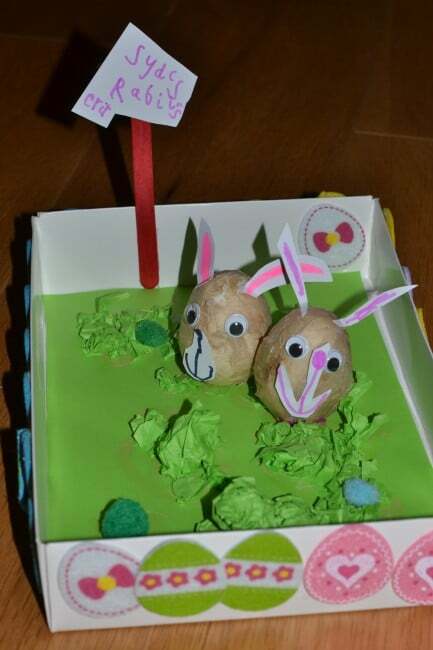 Finally, another “badly captured” Egg Decorating entry is the this Egg-cellent, British Eggways entry. Next up, we have Eggs finishing off their Easter Egg shopping. We have an Egg Racing Track with it’s care taker. 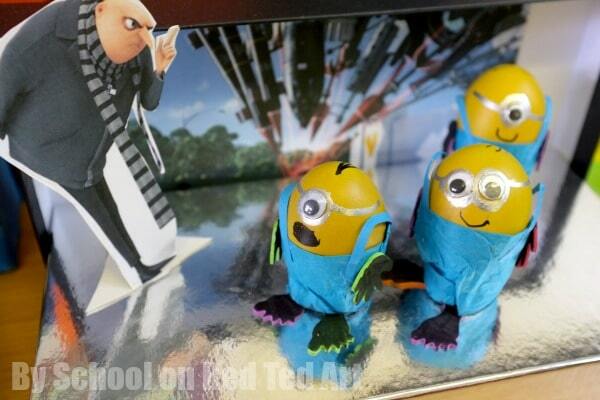 Another winning scene, were these fun fun fun Minions – neatly executed, with additional backdrops and features. A cute little egg sheep. My kids adored the Egg Monkey too. Then we have a martial art egg, about to begin some egg-ercises. And yes, the ideas continue! 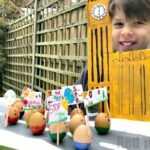 As we live in London (no secret), we have a great Egg Tourist Day (including London Eye and a London Bus, tourists and queen). A cute Spring has Sprung scene. MORE Egg-staterestials – again – the photo doesn’t do it just – this was a huge effort – with a whole habitat and information board – personally, I particularly liked the emu like egg creature. Next there is an Eggsam in progress. Very fitting for an School Egg Decorating compettion! Yes, there is MORE! We have some more Egg Minions. 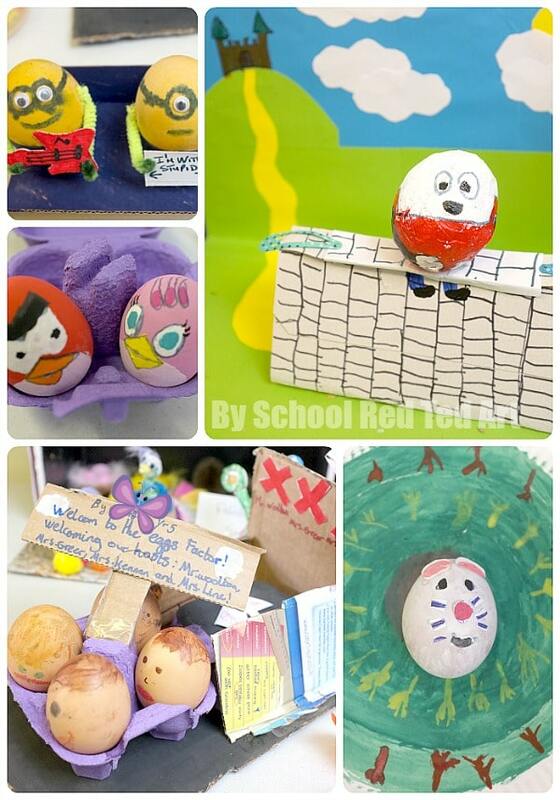 Some great egg angry birds (learn your lesson kiddo – your angry bird eggs are GREAT, but you need a “scene” or diorama in order to win.. trust me, we have learnt). A wonderful Humpty Dumpty (and indeed one of the 8 winners). … a super cute litle Egg Bunny plate. Say aaaah. So sweet! 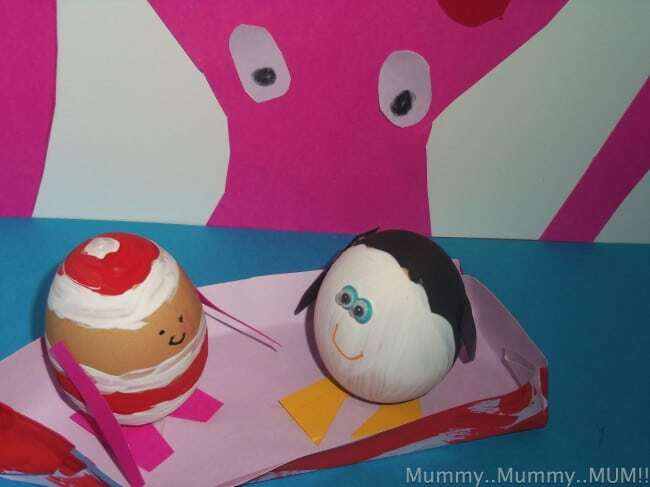 FINALLY, last but not least.. Pip Squeak’s Eggcellent Hairdresser entry (also a winning entry)! 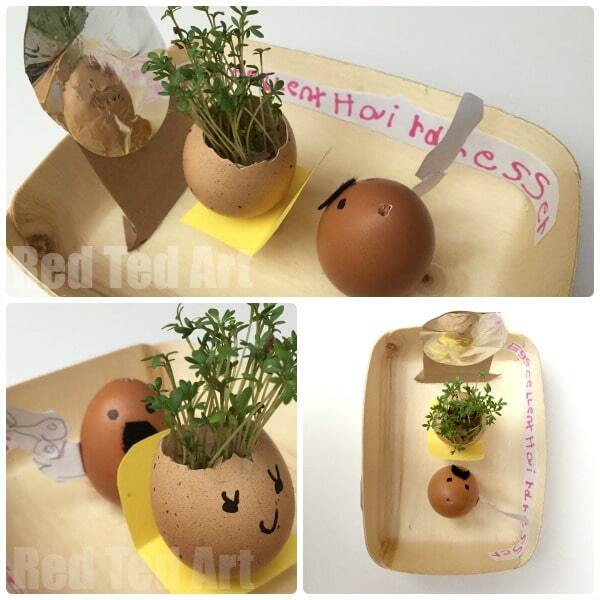 As you can see, we grew some Cress Heads (see more info here). Pip Squeak then decorated the faces – and cut out a mustache from felt for the hairdresser. She drew a hand and scissors on paper, which she cut out and stuck on. I helped make a simple chair and aluminium foil mirror. And finally, she added an “Eggcellent Hairdresser” banner. Right. 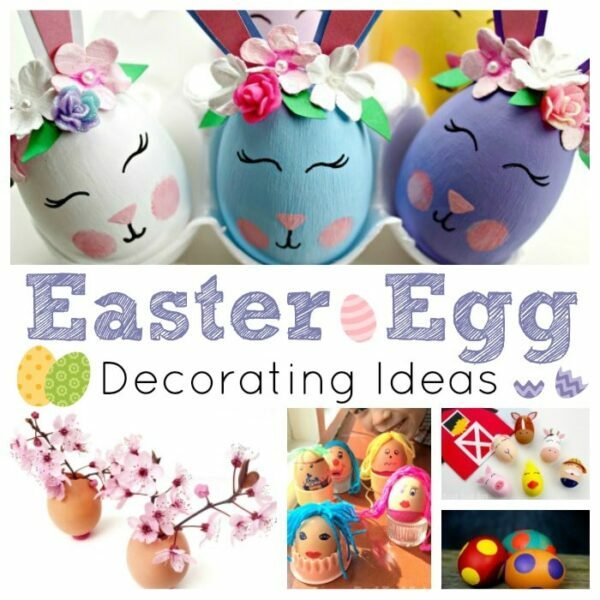 That is it… I hope you have had an eggtastic time, checking out all these eggcellent ideas. Aren’t they simply fun and brilliant? And remember.. if you want to win.. make a SCENE! 20+ MUST SEE Bunny Crafts and 20+ Easter Chick Crafts! Good luck with your School Egg Decorating Competition!!!! Oh what a shame, the kids LOVE egg decorating at our school. Red Ted suggested pirates for next year!!! Thank you so much for these – first time we’ve had to do an egg decorating competition and I was completely stumped before seeing this!! Hope you’re well. Noah sends love from Northumberland.